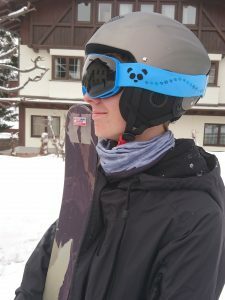 Here at FamilySkiNews, we’re big fans of Panda Optics eyewear for skiing and snowboarding. Not only do we love their cool, cuddly Panda logo, and the cute bamboo detail on the goggle straps, but now we’re pleased to announce that they’ve brought out their first kids’ range… called “Cubs”, of course. My kids took the opportunity to try out some new eye-wear earlier in the month. It proved to be a perfect test as the weather was less than idyllic. Remember that week in the eastern Alps when they were experiencing half-a-metre of snow a day. Well, it was then! 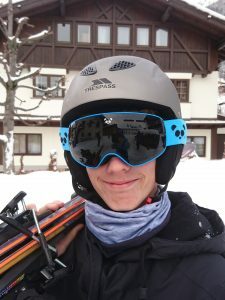 George: “Frustratingly I found the Cubs goggles were a little too small for me as I wear glasses with quite thick frames when I ski. The Cubs goggles were not quite large enough for me to be able to ski comfortably in them so I stuck to my Wed’ze goggles instead, even though the depth of field was better in the Cubs. I think they’d be brilliant for little ones and younger teenagers though. Tim: “I thought the Cubs goggles looked really smart. The fantastic blue colour matched my ski jacket perfectly, and I like the way they come in a beautiful presentation box, and also with a useful micro-fibre bag for storage and cleaning. The design of the Cub is based on Panda Optics’ flagship product, the Diablo adult goggle – it’s a scaled down version with many of the same features. However, unlike the Diablo, it’s doesn’t have a non-polarised lens – to keep the cost down. It does however provide 400+UV protection. 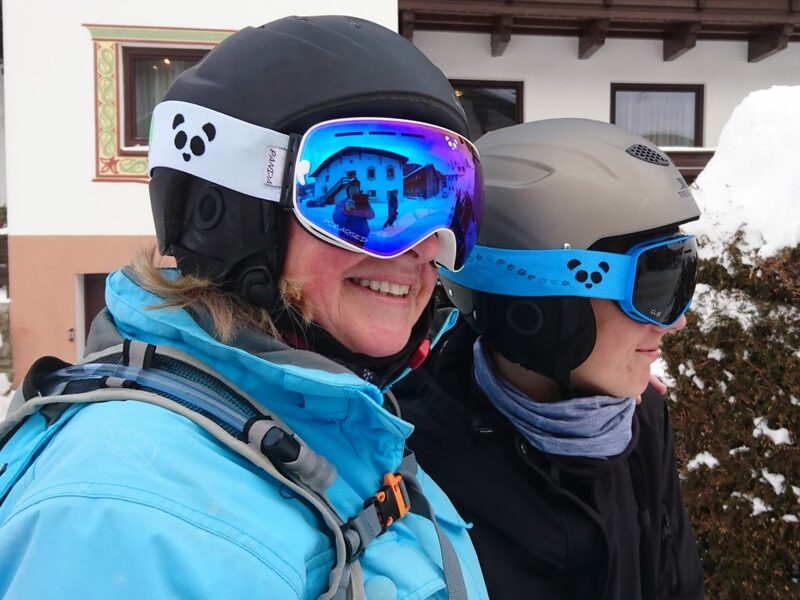 The lens is smoked – it doesn’t have a mirrored or a coloured coating – this gives it a high level of scratch resistance… we all know how kids chuck their ski kit around, so these goggles need to be tough and resilient. The Cub goggle frames are made from TPU (grade 4 rigidy), making them durable yet comfortable, flexible but able to withstand impact. The Cub goggles claim to be fully helmet compatible, but although they were very comfortable to wear, we found the fit was not as snug to the helmet as with the Diablos. Other features include Integrated Guma® anti fog technology; three-layer dual density foam around the frames with a fleece finish for extra comfort; and two silicon grip bands on the strap to keep it securely fixed to the helmet. The strap also feature’s the company’s cute panda logo plus some panda footprints wrapping around the side of the helmet. The Panda Optics Cub kids goggle comes in blue or white, and is suitable for children from 6-13. The standard goggles, which we tested, retail at £54. You can also buy a polarised blue mirror option for £73; or a package with interchangeable lenses (standard smoke/low light yellow lenses for £63.50 or polarised blue mirror/low light yellow lenses for £82.50). PS They all loved my Panda Optics’ Diablo goggles too (when I let them get their hands on them) – you can see my review of those goggles by clicking HERE.